Conquering the Mountain at Killington. 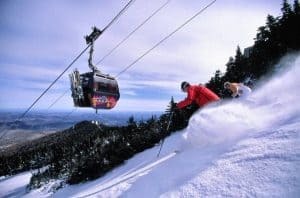 With its amazing 360-degree views of Lake Champlain, Adirondack, White and Green mountains, visiting Killington in Central Vermont is inspirational in offering excitement and sheer energy that reaches from the mist covered mountain peaks to the gushing brooks and rising waters of the Ottauquechee. One experiences nature’s forces as a sudden wind sweeps down from Killington Mountain creating the ultimate challenge to ski this rugged terrain. Battling the elements can be an intense encounter with nature or an epiphany of taking a journey to find meaning in life. In a spur of the moment, we take the challenge to ski, despite unfavorable conditions from the wind, rain, and cold. Well, this is Vermont! It’s exhilarating to take a leap of faith experiencing nature’s dangers with some trepidation. The awesome magic of the mountains prevails along the forested trails and ridgelines and now we know why this is likely the highest rated ski mountain on the east coast. Killington is the perfect retreat to succumb to nature’s wonders and to find the inner light of life that creates a natural state of wellbeing through positive attitude, diet, and exercise. Active engagement is the key and can include a myriad of activities on the mountain, ranging from competitive or recreational activities to new performance-driven sports, such as fat biking, which is mountain biking on snow. Your family can keep busy for your visit with much more than just skiing. Killington: Riding up the mountain. Killington prides itself on using snowmaking equipment to resurface trails when needed and provides terrain that excites, whether it’s uphill and backcountry, groomed trails or glades. 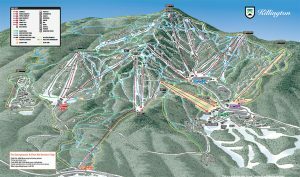 Killington offers nine months of skiing and holds the record for the longest, extended season in the East. The resort doesn’t really stop operating ever since the two ski gondolas also bring hikers up the slopes for real mountain adventures throughout the year. Year-round, Killington can be enjoyed whether it is hiking, mountain biking, golfing or experiencing other outdoor activities. Now the newest Killington and Pico offering is the “Beast 365” Year-Round Season Pass that provides unlimited winter lift access, summer mountain bike lift and trail access, golf course greens fees and adventure center access for a monthly fee. Check the website for the other types of pass options available. 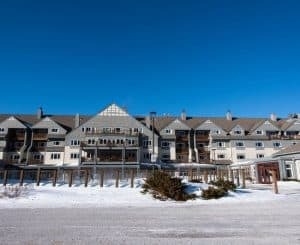 To get the most out of your visit, I enjoyed the premier lodgings on the mountainside at The Killington Grand Resort Hotel that provides convenient ski-bridge access to the slope and ski-in/ski-out services. Start the day with their sumptuous breakfast buffet, then perfect your technique by taking an intermediate lesson with top instructor, Frank, at the Killington Ski School. We’ll spend the rest of the day skiing the slopes before a soothing dip in the outdoor heated pool surrounded by spectacular mountain scenery. Although the resort and spa overlook natural wild landscape, the property is within easy access to the area’s restaurants, retail stores, and a short drive to reach the Long Trail Brewing Company. This riverside pub & restaurant was inspired by the Hofbräu House in Munich and the unique beer selection is plentiful seven days a week. Their seasonal menu compliments the setting and handcrafted beer. Many dining choices are in the area including the Wobbly Barn, Ledgewood Yurt, Jerk Jamaican Mountain and others offering diverse choices for all ages. Before leaving Killington, a stop at the McGrath Pub at the Inn at Long Trail is in order. While noted for its warm hospitality, along with great casual dining and pub fare, yet what sparks conversations are the large volcanic rock formations embedded in the pub. Relax and enjoy a pint of stout with a hearty portion of shepherd’s pie or Irish stew. The McGrath Pub is popular with locals and hikers who often choose this spot as a starting point for their journeys on the Long Trail. Personally, skiing the mountain is a phenomenal experience that has aesthetical appeal and physical strength of using mind over matter in nature’s powerful presence, we’re already plotting our next Killington adventure.